I decided to review these two books as a duet. 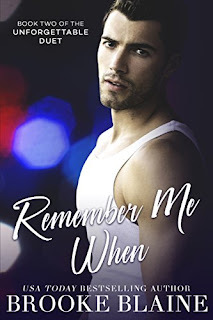 To be honest, I was so emotional after book one, I didn’t know whether to cry and scream or just hold Brooke Blaine up until she gave me book two, but I don’t resort to threats, so I just had to wait…not so patiently…until Remember Me When. Oh man, this story just got to me. I mean I was so choked at times and this is testament to the author because she delivered on all those emotions that I crave and love. This was a stunning MM gay for you romance with a huge twist, a fair amount of drama, a lot of angst and an endless amount of tears. When these two were up, they were glorious as was my smile, but when they were down, damn did I frown. Ollie was an amazing character from the very start. He was honest about his sexuality, he owned it and he had the hugest of hearts. Ollie wore his heart on his sleeve and when he loved, he loved hard and with everything he had. His job as a paramedic had its highs and lows, he saw and experienced things that had the ability to cripple him and yet he never let it affect his outward demeanour. Ollie loved his job, took it seriously and it is this compassion that made him ideal boyfriend material. Reid is a hard one to pin down. In book one, I adored him. I loved how his attraction to Reid developed, I felt their connection from the very beginning and I adored watching these two morph into being a couple. In book two, I felt so sorry for him and you connected with him more with the dual point of view. His frustrations were apparent, his confusion, resentment and his general disappointment with life in general flooded the reader through Brooke Blaine’s words. While some of his actions physically hurt, I could understand, even if it made me want to punch him at times. I had my surprises with this duet, none more so than with Reid’s mother at the end. Ollie need an ally and it came in the most surprising package. I thought Brook Blaine did extremely well in dealing with a tough subject, one that I have read time and time again and never gets old. I love each authors spin on it and this one was done extremely well. My only gripe…would have loved more at the end, but then again, that is another sign of a really good book.